Tuote 100987. GATT LD-9 putkimikrofoni. 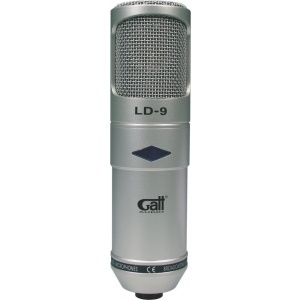 "Vacuum tube condenser studio microphone, which comes with power supply, suspension shock mount and wind screen, cardioid characteristics, frequency response 20Hz - 20khz, max input 128 db, (at 1khz<1% thd), signal to noise ratio is 75 db, it weight 580 grams, and comes in own aluminium carrying case. Putken hehku näkyy sinisen "salmiakki" kuvion läpi.